Subcellular localization of PfCLK-3 and PfCLK-4 in the blood stage. Mixed asexual blood stage cultures containing trophozoites (TZ) and schizonts (SZ) cultures were fixed with methanol and prepared for IFA, using rat antisera against PfCLK-3 and mouse antisera against PfCLK-4 (green). The parasite nuclei were highlighted by Hoechst staining (blue). The asexual blood stages were labelled with rabbit antisera against PfMSP-1. Bar, 5 mm. 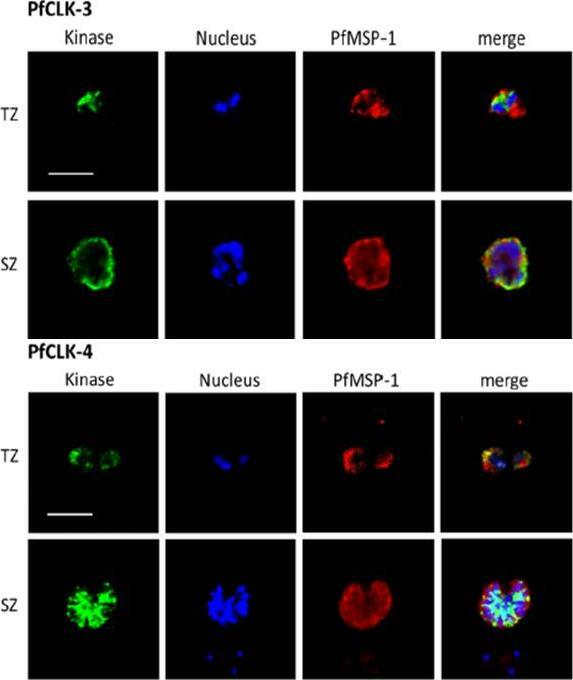 PfCLK-3 and PfCLK-4 are mainly present in the nucleus of trophozoites, while in schizonts and gametocytes both kinases are primarily located in the cytoplasm. Particularly for PfCLK-3 a rim-associated labelling pattern was observed in the latter stages. In the IFAs, the asexual blood stage parasites were highlighted by labelling of plasmalemma-associated proteins, i.e. PfMSP-1.Kern S, Agarwal S, Huber K, Gehring AP, Strödke B, Wirth CC, Brügl T, Abodo LO, Dandekar T, Doerig C, Fischer R, Tobin AB, Alam MM, Bracher F, Pradel G. Inhibition of the SR Protein-Phosphorylating CLK Kinases of Plasmodium falciparum Impairs Blood Stage Replication and Malaria Transmission. PLoS One. 2014 Sep 4;9(9):e105732. Co-localization and control IFAs. A. Immunolabelling of PfCLK-1 with rabbit antisera (red) detected the kinase in the schizonts´ cytoplasm as well as in the nuclei, where it co-localizes with the three SR proteins (green). Schizonts were counterlabelled with rabbit antibodies against PfMSP-1 (red). All nuclei were highlighted by Hoechst staining (blue). Bar, 5 μm. 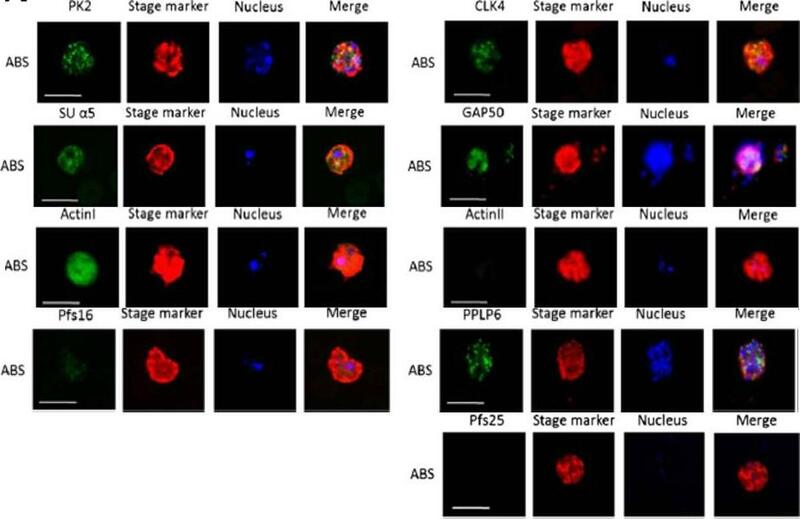 The co-localization experiments confirmed that the SR proteins are solely present in the nuclei, while in the early schizont stage, PfCLK-1 is present both in the parasite nuclei and the cytoplasm. 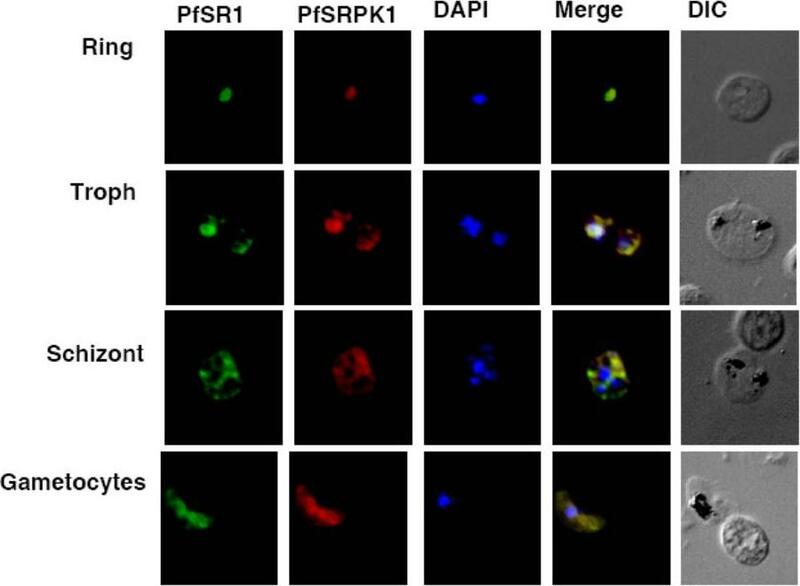 Co-localization of PfCLK-1 with the three SR proteins can be detected in distinct nuclear regions. Kern S, Agarwal S, Huber K, Gehring AP, Strödke B, Wirth CC, Brügl T, Abodo LO, Dandekar T, Doerig C, Fischer R, Tobin AB, Alam MM, Bracher F, Pradel G. Inhibition of the SR Protein-Phosphorylating CLK Kinases of Plasmodium falciparum Impairs Blood Stage Replication and Malaria Transmission. PLoS One. 2014 Sep 4;9(9):e105732.